Hello homeowners, we are homeowners insurance with offices located in Mesa, Gilbert, Tucson and Phoenix. We want to pass along some advice for you regarding your homes and homeowners insurance that you should be looking at today! Start with your TTD – THINGS TO DO list. With all the devastation in our surrounding states from forest fires, we’d like to bring you some advice. A) Plan ahead. If family members are away from home, arrange ahead of time a DCP – designated convenient place to meet away from your home or the possible disaster in your area. Pick a gas station, convenience store, grocery store, maybe a mall, or a school, somewhere YOU all know EXACTLY where to go to meet up, this is your DCP and #2 on your TTD list. Keep in mind, family members must be prepared for this as well, regardless of where you are, you may not be able to get back to your home, you may have to depend on a son or daughter who is at home to do this, so run down the list of TTD with them beforehand, walk thru it once or twice a year. Update it as you need to. B) Plan ahead. Tell ALL family members where you will be planning to go, pick a motel or hotel 20 miles away, write down their phone number on your TTD list, plan on calling them for a reservation when the evacuation order comes. MAKE it number 3 on your TTD. Next, pick an alternate motel or hotel that is 30 miles away, write down that phone number on your TTD list, if you cannot get a reservation at No. 3, this is your number 4 – TTD, your contingency plan, communicate this with ALL family members! Put this TTD LIST of Things To Do and let your entire family know where it is, or better yet, give a copy to your neighbors and your closest family members. C) Have you got a pet (or pets)? Make sure you have a weeks supply of food for each pet set aside. Put this food and where it’s stored on your list of TTD as #5. D) As you make your TTD List, keep in mind how much space your vehicle has, will it (whatever IT is that you are wanting to take with you) fit with everything else on the list? Keep this in mind when you organize your TTD. Be prepared to leave sentimental objects behind, you will NOT have time to dwell on it later. E) INVENTORY – Take a pad of paper and walk through your home and write down everything you have, include taking picture,s which are also helpful. Download your pictures to a flash drive for convenience, but either have a flash drive OR get actual pictures and assemble them all together (pictures should include all room furniture, unique items, grandfather clocks, fine art, jewelry, electronics, heirloom items, irreplaceable items, and collectibles). Put this inventory paper in a safe place, ready to go. Include this INVENTORY on your TTD list. F) BUNDLE – collect the most important papers and keep them in a safe and secure location that you can easily open, grab the bundle, and go. This should include: your family’s birth certificates, social security cards, passports, insurance papers, car titles, and all photos taken of your home possessions and valuables, either the actual prints OR the flash drive that has the pictures. Include this BUNDLE of paperwork on your TTD list. G) Make a list of irreplaceable family pictures that you do not want to lose, this should be a picture checklist, and when you are told to evacuate, grab this checklist and gather up ONLY what you have written down beforehand, you will NOT have time to get sidetracked once the evacuation order comes! Include this on your TTD list. A) TTD #1 – Get your family and pets in the car. B) TTD #2 – Contact immediate family members and tell them to muster at the pre-designated meeting place, you are evacuating. KISS – keep it short and simple. This is your No.2 TTD item. Do NOT plan on having family or friends come to your home once the evacuation order is placed, all roads lead OUT and to safety. C) Proceed with your TTD list of THINGS TO DO. D) Focus on driving safely. Get to your motel/hotel safely. E) RECEIPTS – Typically your homeowners insurance policy will cover reasonable expenses for room and meals. Save your receipts if you are told to evacuate your home by emergency personnel. Most policies cover this but have daily limits. F) Once you have reached your safe hotel/motel, THEN contact family & friends and inform them of same. If you need help accessing your homeowners policy for disasters and the like, we’re here. Contact your insurance agent before you actually need us. Our advice is free. Bring your inventory list with you. It is that time of year again… Monsoon Season! 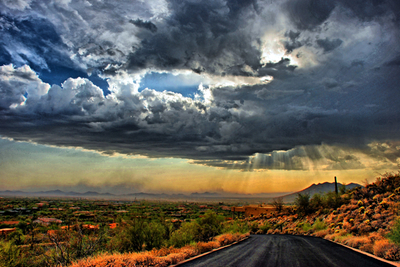 During Monsoon Season, homeowners experience the beauty and splendor of the Arizona terrain. Flowers are in bloom thanks to more rainfall, hail and the beauty of our sunsets is magnified. It is the time of year when the animals come out in force- more than any other time of the year. Everything is radiant, until one morning when you look up and see what you have been dreading since the rains first started. Nightmares of that last hail storm begin flooding your dreams: roof damage. This damage is of course, not always delivered in the form of hail. Tree branches and high winds can add damage to already aging roofs and deteriorate living conditions and affect the costs of utilities over time if repair is stalled for too long. An even bigger hazard to your health, your roof, your wallet AND you standing with your insurance are roof repair scams. Everyone has heard the horror stories of scam artists who took their victim’s insurance money and disappeared into thin air, leaving behind unfinished work or not showing up to do work at all. We have found through the years of taking calls from clients that not all roofing contractors are the same. –Take the time to shop around: There is no shame in getting multiple quotes from different roofing companies. Go for it! In addition, your insurance agent may even be able to provide a list of roofing companies or refer you to roofing contractors that are located in your area. But you will never know if you don’t ask. –Don’t find yourself in high pressure situations: If a salesman is trying to pressure you or if something just doesn’t feel right about it- listen to your gut instincts. A good roofing contractor will work with you in order to get your business, not pressure you into a contract. –Research all roofing companies that you are considering: Before you begin deciding which roofing company you want to use, make sure that they are a legitimate business with a license to do home repair work in Arizona. The presence of a contractor’s license is very important as it can help to identify whether or not the company is a legitimate business. You can look up license numbers and get more information at the Arizona Contractor License Center. In addition to the above website, you can also refer to websites such as the Better Business Bureau (www.bbb.org) or websites such as Angie’s List (www.angieslist.com), which can aid you through reviews written by previous customers (however, you should always take these reviews with a grain of salt). -Don’t be afraid to ask questions: This is your roof. It is something that will be hanging over your head (literally), for quite some time. Asking questions is not a bad thing. Often times, a good company will encourage asking questions. –NEVER pay prior to repairs: One staple of being scammed is that the salesman will want the money before the work is started. So don’t give the full amount until the work is complete. Some roofing companies do require money before hand, but a legitimate contractor or roofing company shouldn’t ask for the full amount prior to completing the project. If you do have storm damage and you have extensive water damage in your home, you should call a water damage repair contractor. Many times you will have a tree that has fallen and you need a tree removal company. For more tips and articles regarding insurance, please visit: Arizona Capital Insurance. There are over 3,400 fatal accidental drownings in the U.S. annually, with children ages one to four having the highest drowning rates. Fatal drowning remains the second-leading cause of unintentional injury related deaths for children ages one to 14 years old, according to the CDC. In addition, for every child who dies from drowning another four children will be treated for “nonfatal submersion injuries” which can cause brain damage that may result in long-term disabilities including memory problems, learning disabilities and permanent loss of basic functioning (e.g. permanent vegetative state). Pool owners need sufficient liability coverage to cover their pool. Most homeowners insurance policies have at least $100,000 of liability protection. However, since pools are considered an “attractive nuisance,” homeowners may need additional liability coverage. The I.I.I. recommends at least $300,000 to $500,000 of liability coverage for pool owners. Homeowners also need enough insurance coverage to replace the pool if it is destroyed by a natural disaster. Completely surround the pool with a four sided fence that is at least 5 feet high, as required by law. If a residence makes up one side of the pool enclosure, there must be a barrier between the home and the pool that is at least four feet high. Install an appropriate pool cover. Arizona requires a motorized, key-locking, ASTM approved pool cover. Layer child safety measures such as pool alarms that sound when a child enters the water, self-closing latches that prevent a child from opening the pool gate, and alarms on exterior doors or windows that will alert when doors leading to the pool are opened. Install a VBG compliant pool filter. Keep children away from pool filters or other suction devices and make sure that supervising adults know how to shut down the filter in case of an emergency. Make sure that pool guests know how to swim. Proficient swimmers should accompany beginners, and adults should supervise children at all times. Have emergency supplies such as ring buoys, reaching poles, and a first aid kit easily accessible. Post emergency numbers on the phone. Keep a phone close to the pool. Regularly check the pool area for hazards such as glass bottles or toys that could cause an accident. Keep radios or other electronic devices away from the pool. Restrict alcohol use near the pool. Alcohol is involved in almost half of water related deaths for both adults and teens. Learn basic life-saving techniques such as rescue breathing and CPR. Taking these basic safety precautions can help you and your friends safely enjoy your pool this summer. Pool safety doesn’t just prevent claims on your homeowners insurance policy, it also saves lives. For more information on pool safety, you can view the state guidelines at the Arizona Department of Health Services website. 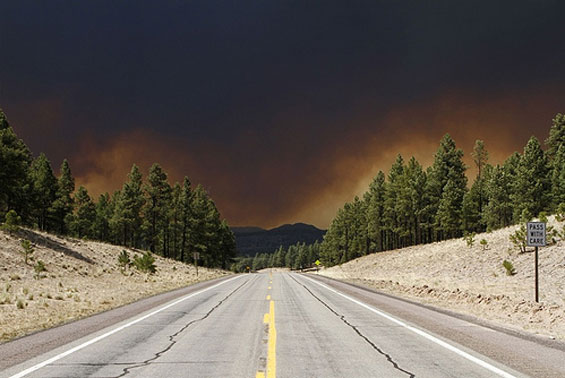 The 2012 Arizona wildfire season has already started, and the U.S. Forest Service estimates that the 2012 season could be as bad as the historic 2011 fire season. The 2012 National Seasonal Assessment predicts an “above normal significant fire potential” for the mountains, with a normal significant fire potential predicted for other parts of Arizona. As of May 16, the Gladiator Fire had already destroyed four structures and threatened almost 400 more. Is my insurance coverage enough to rebuild my home at today’s costs? Insuring your home for its value may not be enough to rebuild your home at the price of current construction. Adequate coverage should include a replacement cost policy that will pay for the replacement of damaged property with comparable materials. Arizona homeowners might also want to consider an extended replacement policy that will pay an additional 20% above policy limits if a disaster–such as a widespread wildfire–raises the cost of materials and labor. Other options include inflation or ordinance riders which help cover the impact of inflation or new ordinances on construction costs. Is my insurance coverage enough to replace all of my possessions? Most homeowners insurance policies cover possessions at a rate of 50-70% of the amount of insurance on the structure of the home. A home inventory is the best way to determine if this is enough coverage to replace your personal possessions if they are lost to a fire or other disaster. You can insure your personal possessions by either a cash value or replacement cost policy. Cash value policies cover the cost of replacing your property after depreciation. Replacement cost policies cover the replacement cost of your possessions at today’s prices. Your insurance agent can help you determine whether a cash or replacement policy is the best option for you. Will my insurance cover my extra expenses if my home is destroyed? If your home is destroyed in a wildfire or other disaster, there will be additional expenses beyond replacing your home and possessions. Coverage for additional living expenses would pay for the extra cost of living away from home and includes expenses such as hotel bills and restaurant meals. It could also cover lost rental income if you rent out a portion of your property. Will my homeowners insurance adequately protect my assets? This question isn’t directly related to disaster planning, but it is still an important factor in evaluating your homeowners insurance needs. Liability damage protects you against claims made for bodily injury or property damage caused by you, a family member, or a pet. Liability damage covers court costs as well as any costs incurred in a court judgment up to the limits of your policy. Additional coverage beyond your policy limits is available in the form of an excess liability or umbrella policy. 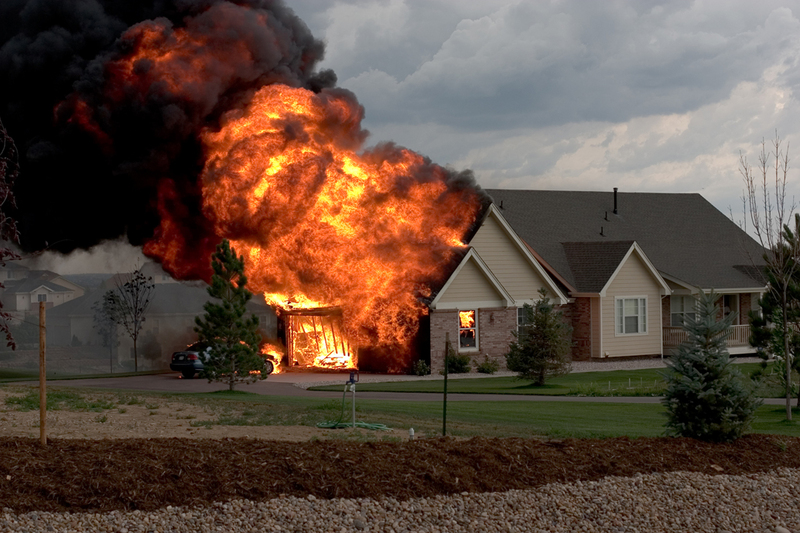 Wise preparation for fire season should include making sure your home is adequately insured. Your insurance agent can help you evaluate your insurance needs. Now that you’ve purchased your homeowners insurance, it’s time to think about steps you can take to prevent, or lessen, future homeowners insurance claims. Buy enough coverage: Find out what it would cost to rebuild your house in your area. Want to keep the same look to the house? Ask a builder for an estimate on the cost to rebuild. Don’t skimp on coverage, and forget about paying that little extra for that piece of mind for insuring your home and belongings. Bring on the fire department: Ask your local fire station to come by your house and do a fire safety inspection- and include your kids when they come to your house. Spotting fire hazards and fixing them will certainly pay off in the long run. Insure that Picasso: Okay, maybe you don’t have a Picasso hanging in your entryway, but you might have a few, so-called luxury items like jewelry and an heirloom desk sitting in the den. Make sure you have the ‘rider’ for coverage, if needed. Water… water: Everywhere. If only you would’ve changed that leaky hose on the washing machine before you left on vacation. Do a survey of your in-house connections. Sprinkler system? Make sure the automatic timer is working correctly and not ‘hanging up’ for hours on that station by your basement window. Accidents waiting to happen: Walkways and steps invite all sorts of potential for liability claims from strangers or friends coming to your property. Make sure step rails and decking are in good repair. Wind and hail: It’s not uncommon, or rare, for a major onslaught of wind and hail to hit parts of Arizona. Heed warnings by battening down patio furniture, or screen doors…and even keep tree limbs trimmed back. It makes good sense to review your homeowners insurance coverage with your insurance agent at least once a year.